More than half a century ago since it was originally published, Heavy Weather Sailing remains the definitive tome on the subject. We’d wager that WindCheck Contributing Editor Joe Cooper had this book when he was a lad in Australia… and that he still owns that same well-worn copy! Thoughtfully updated to reflect the latest thinking, this beautifully illustrated seventh edition incorporates the newest recommendations for surviving a storm at sea, including expertise on selecting and setting storm sails, anchoring, deploying sea anchors and drogues, and preparing your boat for rough conditions. In addition to the foreword by Sir Robin Knox-Johnston, several very accomplished sailors and powerboaters contribute chapters in which they share wisdom glean from their own experiences. Ewen Southby-Tailyour recounts the actions he took while being driven towards a lee shore in 55 knots after the forecast turned out to be wrong; Alex Whitworth describes running under bare poles in an 80-knot storm; and Lin & Larry Pardey recall the use of their own well-tried techniques in their worst-ever storm. An essential survival handbook for anyone contemplating a voyage out of sight of land, Heavy Weather Sailing should be required reading for sailors in every junior big boat program. 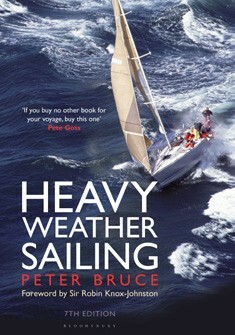 Peter Bruce took over the compilation and editing of Heavy Weather Sailing from its original author, Adlard Coles, for its fourth edition, and has overseen the subsequent three editions. An active cruising and racing yachtsman, he is one of the top Corinthian sailors in the world, having been guest skipper, helmsman and navigator aboard numerous racing yachts. Let’s Take a Veteran Sailing!